Pretty much everything I did this week could have had a ‘last time’ label attached to it – last Party Room meeting, last Committee meeting, last Whips meeting, etc. I’ve avoided recording all of those, as it quickly gets rather tiresome. However, I thought I’d record the last Democrat question ever asked in the Senate. Partly because of that historic significance, but also because I think it is and will remain an important ongoing issue. Senator BARTLETT (2.42 p.m.)—My question is to Senator Evans, the Leader of the Government in the Senate and the Minister representing the Minister for Families, Housing, Community Services and Indigenous Affairs. I remind the minister of the Senate resolution of 30 March 2006, which was supported by all parties, calling for the development of a national strategy on the abuse of children, in partnership with state, territory and local governments and key stakeholders. I also remind the minister of the Senate resolution of 20 September last year, again supported by all parties, which noted the damaging long-term effects to Australian society caused by the serious abuse of children and young people and which expressed support for a comprehensive royal commission into the sexual assault and abuse of children throughout Australia. Given that government senators supported both these calls for action when in opposition, and opposition senators supported both these calls for action when in government, can the minister inform the Senate what has and is being done to act in the spirit of these unanimous and very important Senate resolutions? Senator CHRIS EVANS—I thank Senator Bartlett for what was his last question and for his ongoing interest in these issues. The government believes that as a nation we do need to do much better at protecting all our children from neglect and abuse. I think the recent reports of child neglect in Adelaide and Canberra have deeply disturbed the nation. To be confronted with the severe neglect of children, resulting in the horror of malnutrition or starvation, is pretty confronting. It seems incomprehensible that these things can happen in suburban cities in Australia. These cases of course are now the subject of police investigations, but I think we all support the view that children deserve a safe, healthy and happy childhood. We all share the community’s concern about child neglect cases. As a nation we obviously need to do better at protecting all our children, and this includes state and Commonwealth governments. In 1999, there were 107,000 notifications of abuse or neglect of children. By 2006, notifications had increased to 309,000. Last year, there were around 60,000 occasions when authorities found that a child either was or was likely to be harmed, abused or neglected. Those rates have doubled in the last decade. The number of children in formal out-of-home care has doubled between 1996 and 2007, from almost 14,000 to over 28,000. So child abuse is very much an issue for national concern, and that is why the government is delivering on its election commitment to develop a national child protection framework. Progress on the framework has begun, as a result of recent budget commitments. In January, the Minister for Families, Housing, Community Services and Indigenous Affairs, Ms Macklin, met with the key community experts in child welfare who were calling for national leadership in protecting children. Workshops were also held with representatives from state and territory agencies responsible for child protection and family welfare to discuss a national approach. Minister Macklin released a discussion paper in May, after consulting with these groups. It is available on her department’s website, and the minister is distributing copies to all members of parliament. She welcomes feedback from members of parliament in developing this framework. Intensive consultations with key stakeholders are already underway. A joint meeting has been held with state and territory governments. A number of expert committees, drawn from the community sector, academics and child welfare practitioners, have been meeting over the last two weeks. In coming weeks, Minister Macklin’s department is hosting a meeting with the 51 representatives of the Coalition of Organisations Committed to the Safety and Wellbeing of Australia’s Children. While statutory responsibility for child protection is with the states and territories, consultations are exploring practical ways the Commonwealth, the states and territories and non-government organisations can use their resources more effectively to improve the safety and wellbeing of children. Under the framework, the Australian government will give state and territory child welfare authorities the power to advise Centrelink to quarantine government payments to ensure children are provided for. The budget committed $36 million to our welfare reform agenda, and that will help protect children. Senator BARTLETT—Mr President, I ask a supplementary question. I thank the minister for outlining some of the focus the government has given this important issue since coming to office. I appreciate that it is a work in progress, I appreciate that government cannot fix everything, and I appreciate there is no magic bullet. I would like to ask the minister whether or not the government and the minister are giving serious consideration to putting in place a national commissioner for children, or some similar office, as an independent, permanent officer who will focus continually on the interests of children—as was recommended unanimously by more than one Senate committee inquiry, such as the forgotten Australians inquiry in years gone by. Senator CHRIS EVANS—I thank the senator for his supplementary question. I think the key response is that this government has made the protection of children a federal priority. We have actually sought to engage the Commonwealth very much in the fight against child abuse and neglect, even though it is predominantly a state responsibility. We do recognise that, unless the whole nation takes on this responsibility, we will not deal effectively with this growing epidemic, almost, of abuse. I think what has happened in recent days has brought home to us that these are not just issues for Indigenous communities. I think some people were taking far too much comfort, as if the problem is only in Indigenous communities. These are problems for Australia. In terms of Senator Bartlett’s specific request about a child commissioner, I will take that part on notice. I am not sure what the minister’s views are with regard to that particular initiative, but I can assure the Senate that Ms Macklin is very much focused on this work, and there will certainly be more to come. Between 1999 and 2006, it appears that notifications of child abuse and neglect increased to 3 times the number. I’m wondering how many of these were frivolous. I know of quite a number of ordinary, responsible parents who’ve had the police on their doorsteps (and sometimes social workers as well) when some stupid neighbour has phoned them. I don’t consider that raising your voice to get the message across, or delivering a non-injurious smack or two, amount to child abuse. I’m sure lots of complaints are frivolous, and take away precious, inadequate resources from those children who are actually being seriously abused and neglected. It is with great sorrow that the moment arrived in which yourself and the Democrats were removed from active parliamentary life. It is true that I didn’t always agree with you (though I did more often than not), yet your views were always very well thought out, articulated, and expressed. On more than one occassion a speech or blog you made educated me on an issue that wasn’t in my consciousness, or significantly modified those on which I previously held strong views. You have a unique perspective which I have grown to value, and it diminshes our democracy not to have your continued presence. At the same time I, along with much of Australia, am grateful for your time as a Senator and your ongoing contributions to the nation. I suppose it’s natural that the best of times ends with the worst of times. All the best mate. i do hope that our paths cross one day so i can shake you hand and say thanks . as for child abuse sadly i think this is only the begining . Andew ,if you are going to keep the bastards honest,you have to do likewise with own party.Meg Lees’ capitulation on the GST issue was wrong and it was the beginning of your demise.We were promised an alleviation of a whole rank of state taxes that did not eventuate.Instead ,we got more waste and more taxes.The bureacracy just grew to momunmental self serving proportions,so why should the electorate back a parisite in the name of the democrates or any other party who see their own survival as being paramount to the general well being of society?Don Chip was a decent bloke who has my respect,but those who followed just lost the plot. What Mr Rudd and Ms Macklin should do is stop farting around with discussion papers and consultations and implement without delay the policy the Labor Party took to the last election. 28. Labor believes that all areas of government must reflect the intrinsic value of children and young people in their policies and programs. 29. Labor will establish a specialised government Office for Children and Young People. The Office will have responsibility for developing a coordinated strategy between, and analysing policies arising from, different portfolios for impacts on children and young people. 30. Labor will also establish a National Commissioner for Children and Young People in order to promote their interests as participants in our community and to promote investing in children and young people. 31. The National Commissioner for Children and Young People will establish a national code to protect children and young people from abuse. The national code will be developed in consultation with the States and Territories and will ensure that all organisations have adequate procedures to prevent abuse and handle any complaints. The code will include a national working with children check. They could speed the process up considerably by adopting the National Commissioner for Children Bill 2008 (http://parlinfoweb.aph.gov.au/piweb/Repository/Legis/Bills/Linked/18030800.pdf) introduced by Andrew in March this year which is virtually identical to the Bill introduced by Nicola Roxon some years back – but which was allowed to lapse. thank you from my small son for speaking up for him about child abuse. Thank you for giving his plight expression in the world of power and in doing so giving him the value he deserves. His voice was heard in your earlier speech on “Child Sexual Assault in the Context of Family and the Family Court”. I hope that your active stance and conscience leads to future decisions that leads eventually to his protection. In a world of cowards… walk tall!. And thanks too for making me realize that not all Australian Democrats were tarred with the one brush. Don Chipp and all the pioneers and the early supporters of the Australian Democrats would be proud of you. 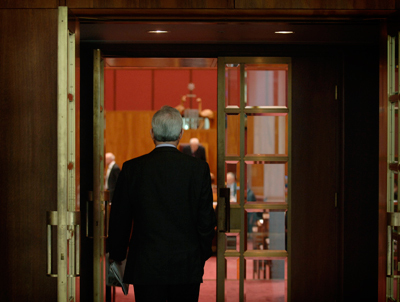 Your place in Australian political and social history has been made …. and nobody can ever take that away from you. Good on you all. A great pity to see a great institution die. I have less optimistic hopes for the Greens. But who knows? In some ways it always seemed to me that the Dems were the only genuinely principled political party around. Not that they didn’t compromise, as that was their job. But they always took the principle that they were a minor party seriously – always sought to add value to the process of government. You had to do your fair share of grandstanding as that’s the only thing the media respect and report, but it would so often have assisted your grandstanding to oppose something that would have buggered up the process of government – for instance by blocking supply bills or otherwise upping the ante, but you always held back. Sorry to see you around, but I always suspected it would be difficult for such a party to survive. And a tragedy that a few people took their apparent personal dislike of Natasha as far as they did. . . .